Silicon Valley’s top venture capital firm Kleiner Perkins is increasing its bet on Apple’s iPad. The firm has added another $100 million to an “iFund” that had started with an initial deposit of $100 million two years back. The firm’s focus was to invest in startups dedicated to building applications for Apple’s iPhone and iPod Touch. With previous investments in companies like Google, Amazon this surely is another succesful investment from Kleiner Perkins. Apple has already opened up the iPad for pre-orders and will make it available on Saturday. Priced at $149 check out this interesting device which comes with a 2GB card and offers 100 public domain books (including The Bible). The device works with PDFs, ePubs and Mobi files. Although it it does not have all the cool features of Kindle, for that kind of a price it may work out to be an inexpensive solution for users who might want to read ebooks available online and not through the Kindle store. Another Publisher Goes With Apple’s Agency Model – What should Amazon do? Perseus Book Group (one of the largest distributor of independent publishers) has decided to go with Apple’s Agency model (70-30 split). Perseus Books Group, a large independent publisher that also distributes works from 330 other smaller presses including Grove Atlantic, Harvard Business School Press,Zagat and City Lights Books, signed a deal last week with Apple, following five of the six biggest publishers that have already signed agreements with Apple. There is no doubt that 2010 has a lot to gain from the e-book industry. 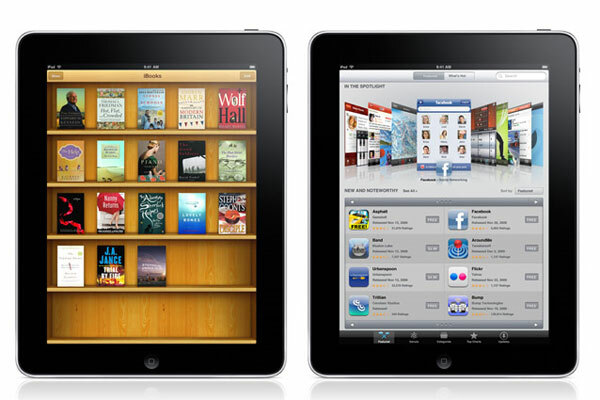 There are six e-book devices (Kindle, Nook, iPad etc) in the market and more soon to be released. As per predictions from a major business magazine up to seven million of these devices will be offered for sale next year. Moreover, one of the major consulting firms have predicted that e-book sales will account for close to 10 percent of the the publishing market in five years. Clearly that indicates the rate at which more and more publishers will switch to electronic book publishing. But this was not the case in the year 2000. Here are a few reasons for what went wrong in 2000 for the e-book industry and how could those mistakes be avoided in2010. 1. Lack of sufficient e-books – One of the mindsets that users of e-book devices had and still have is that if they don’t get to read all the books (literally all books under the sun) on their device then the worth of the device starts losing its value. If voracious readers are asked how many books would they like to read on their e-book device they would just say all (else there is no point spending hundreds of dollars on the device). But in 2000 there weren’t much e-books available. They were expensive to covert to an e-book format and publishers were too reluctant to think in those terms. Today, the scenario is different – far better (although much scope to improve). Almost all of the top 10 New York Time Bestsellers were available in e-book format. Although some issues around the availability is the timing. Barnes & Nobles had 15 books i its Coming Soon List but made only 6 out of those 15 were made available in eb–k format the same time as the print release. That still is and will continue to be a huge concern for users and this is somethig the ebook industry should be careful about. Another concern that needs to be addressed is the gaps in the way the books are available. For example many of the books of popular authors are not available in the Kindle store but are available in Nook device. There needs to be some consistency here in order to increase the e-book adoption rate. 2. Pricing – In 2000 many of the ebooks were priced the same as their print versions. But the way a user percieves a hardcover book is different from the way he would look at an e-book. Hardcover books gives a nice feeling, has more substance and they can keep it in their book shelves to show how tasteful they are. But all of this is missing in an e-book. Moreover, due to the same reason the cost of publishing an ebook is much lower as compared to a paperback/hardcover. So why not pass on that cost saving to the users. keeping the same price is definitely not justfiable. Amazon had been trying to resolve this by pricing the ebooks much lower than their print versions but this arrangement could not be carried on due to challenges raised by Macmillan. And now Apple also in a way supporting what Macmillan had been asking for the industry is shifting towards agency model pricing (where the publisher and NOT the retailers decide the price of the ebook at which the retailers will have to sell to the end users). Pricing still remains a big topic of debate in 2010. 3. Poor Marketing – One of the ways by which a market for tech prodcucts are created is by identifying a groups of users and some of the problems they are facing and then trying to solve their problem with the product. I am not sure if ebook had succeded in filling up this gap back in 2000. But even now I am not sure if that need for an ebook device/reader is felt very highly. I think most of the buzz and envestment in the ebook industry is still being driven a lot by strategy than by user needs. Its just that ebooks are considered to be a huge area of oportunity and so all publishers and electronic companies are jumping into making their own device just to be sure to take full benefits of the opportunity. I think the need/benefit for an ebook needs to be better pronounced. 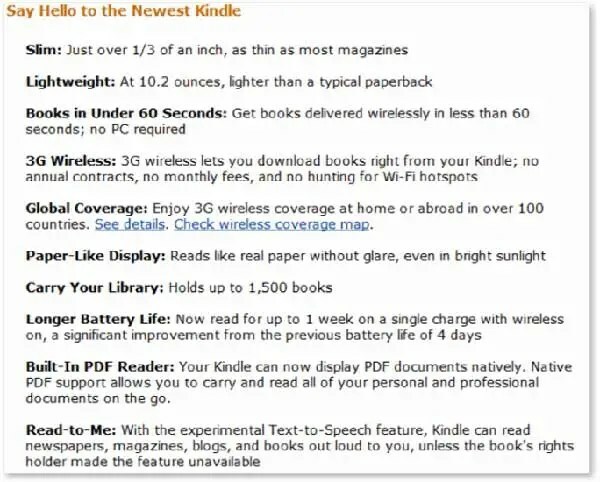 Check out Amazon’s announcement of why one should use kindle – Point to see is that it lists all the features but not the benefits to the users.